Our colleagues at the flank ILB station in Flint had become stranded on the grass banks of the River Dee whilst investigating a drifting boat the previous day. the ILB was left at anchor and the crew evacuated after 5 hours by helicopter. Rhyl ILB crew were requested to go by road to Flint lifeboat station the following morning, to take some Flint crew out to retrieve their boat. The ILB was launched at Greenfield dock slipway with 2 Rhyl crew, 3 Flint crew, and the deputy Divisional Inspector on board. they proceeded across the estuary to the English side of the Dee, and followed the incoming tide up the 3-4 metre deep channels which cross the grass banks. They managed to get within about 30 metres of the stranded ILB, and by removing much of the equipment off the boat, managed to get the boat back to the gutter alongside Rhyl ILB, and then recovered the equipment previously taken out. The engine of Flint ILB was started, and the 2 ILBs then made their way the mile across the estuary, and the 2 miles downstream to the launch point at Greenfield Dock. Both crews then returned to Flint station to debrief and clean the mud from the boats. The Rhyl crew then left Flint by road, returning at about 1500. 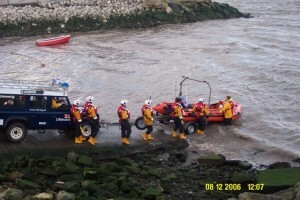 Rhyl and Flint crews at the stranded Flint ILB. This grass gets covered by high tides. Rhyl’s mechanic alongside Flint ILB recovered into the gutter. Note depth of banks sides. Rhyl ILB about to launch with Flint crew at Greenfield, to recover Flint ILB. Holyhead Coastguard received a report from North Wales Police, of a 14-year old male going into the sea off Splash Point, Rhyl. As the AWB was on another service, and was 15 minutes away, the ILB was launched to search close inshore whilst the AWB was also tasked for backup illumination. 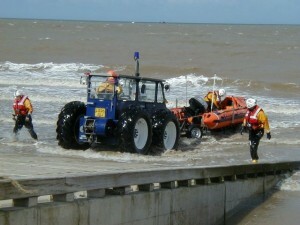 The mobile was also on another task, and so the Landrover, Talus and County tractors were employed for a beach search. The youth had entered the sea on previous occasions, and so the police were concerned. All units, together with coastguards on foot, had been searching for about 20 minutes when it was found that the male was safe ashore, and all units were stood down, the ILB and AWB returning to station at 1910. As ILB was approaching the beach after the normal Sunday morning exercise, the crew noticed 2 people cut off by the incoming tide off the Sun Centre at Rhyl. The ILB made to their position, and the people were escorted ashore, the ILB returned to station at 1150. ILB launched to Prestatyn Barkby beach., after Holyhead coastguard received 999 calls of 3 people cut off on a sandbank by the incoming tide. As the ILB was approaching Prestatyn, it was reported that the people had made it safe ashore, and the ILB was recalled, returning to station at 1900. ILB requested by Holyhead coastguard to proceed up the river Clwyd towards Rhuddlan, where a farmer had attempted to recover a sheep that had fallen in the river, and had become stuck in the mud. 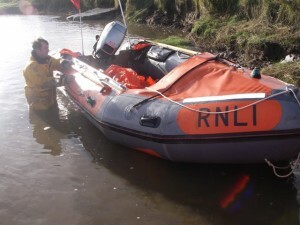 The ILB was taken by road to Rhuddlan, and launched in the river there. 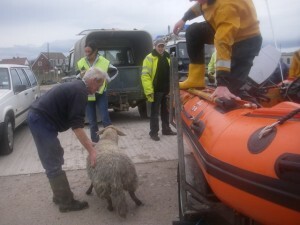 The coastguards on the bank managed to get the man out of the mud as the ILB arrived, and so the crew went to recover the sheep, returning it to Rhyl harbour, where it was reunited with the farmer. The ILB returned to station at 1500. 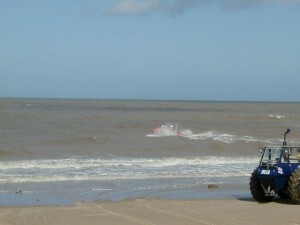 LandRover requested to go to Prestatyn Barkby beach, to assist coastguard teams recover unconscious man from beach, after he had fallen from a small day boat as it approached the beach. The 3rd Mechanic proceeded, and the man was recovered t the ambulance on dry land. Not strictly an ILB service, but recorded as an incident with the coastguard. LandRover returned to station at 1200. A member of Rhyl Yacht club phoned the mechanic to report the erratic course of a small inflatable boat with 2 people on board, just off Rhyl beach. The boat was going on different courses, then stopping. The local coastguard were paged and observed the craft from the boathouse, and suggested the ILB to launch to investigate. This was done some 5 minutes later, and the ILB came alongside the boat some 8 minutes after that. 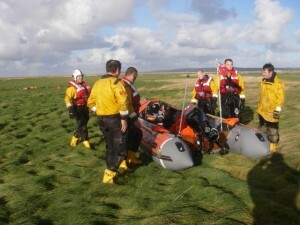 the 2 crew were kitted out in wetsuits and lifejackets, but were disorientated from their launch position at Prestatyn. The ILB crew then escorted the boat to their launch point. The ILB Landrover went by road to Prestatyn due to the deteriorating wind and rain conditions, and recovered the boat with it’s trailer first, and then the ILB, returning to the boathouse at 1735. Crew pagers activated after people on the Sun Centre car park heard noises of a person in the water shouting for help off the boathouse. When the ILB crew arrived on station, the police and coastguards were on scene, and the man had been brought out of the water and had been laid down at the foot of the slipway. There was no need for any actual lifeboat to launch, but the crew assisted coastguards getting the man into the coastguard vehicle to take him up the boathouse to an ambulance. Crew stood down at 0020. Classed as standby. ILB crew paged to assist North Wales Police officers on the ground and in the police helicopter NW1, to search for a male committing suicide by going into the sea between Rhyl harbour and the Rhyl/Prestatyn boundary. The helicopter was using thermal imaging and just after the ILB had launched, located the man in the shallow water, lying down, as the tide came around him. The Crew were advised to stand off whilst police officers got the man out of the water, but were then called to assist police and ambulance personnel to give him oxygen, and provide a stretcher using the ILB’s ambulance pouch and 2 oars , to get the man the 200 metres to the promenade. Other crew had gone to the location in the station LandRover LR74, and assisted to get the man on to the promenade, where he was taken by ambulance to hospital. The ILB returned to station at 0155. 3 youths in a small inflatable dinghy had been watched by the crew at the boathouse, playing in the water off ASDA Kinmel Bay. The boat had returned to the shore ,but went out again, and was about 1/4 mile out, and was being taken offshore by the strong Southerly wind . 2 of the youths got out of the boat and started to swim ashore, finding the task difficult, then the third fell out after breaking the paddle, and was slowly making it to shore. Holyhead coastguard were informed, and requested ILB assistance. The ILB was launched within 4 minutes, and came alongside the youths 3 minutes later. 2 of the ILB crew entered the water to assist the swimmers make it back to shore, and then they were met by Rhyl coastguard team and an ambulance. All 3 were checked out and found OK but tired after all their efforts. The ILB crew then returned to sea to collect the dinghy, which was over 1 mile out by then. This was retrieved and the ILB returned to station at 1500, and the dinghy was collected by the youths later. Crew were at the boathouse for a normal Sunday meet, when the coxswain noticed an object in the water off Towyn, looked like a white hull of an upturned boat. The ILB launched as there was a crew there, and were on scene within 10 minutes. The object turned out to be a very large log, bleached by the sea and sun, with a branch going upwards. It was too large for the ILB to take to the shore, being about 5 metres long, so the coastguard were informed of it’s position, and the ILB returned to station at 1205. Rhyl mobile coastguards reported an object in the water off Pensarn sewer buoy, which a member of the public had brought to their attention. ILB crew were paged and proceeded to spot to find the object was the same tree they had been out to earlier. On the boats passage back, a half-inflated toy boat and a beach ball were recovered before the ILB returned to station at 1530. Crew paged by Holyhead coastguard to an inflatable dinghy with 2 teenagers on board, drifting out from Golden Sands camp, Sandy Cove. ILB launched at dead high water from the slipway, and proceeded to site, picking up the dinghy and taking the 2 children on board, and returning them to the shore at Towyn, about 1.5 miles away, where they had drifted from. the ILB returned to station at 1312. A member of the crew at the boathouse was looking through the boathouse binoculars and saw what looked like a surfboard in the water about 1 mile from the boathouse. It was not certain that anyone was aboard, and so Holyhead coastguard were contacted, and they requested the ILB launch to investigate. This was done, and the crew came alongside a body board, with no-one on board. A search of the area found no persons in the water, and after consulting with the coastguard, who had not had any further reports, returned to station with the board. Subsequently, no-one was reported missing. The ILB returned to station at 1145. One of the council beach guards at Prestatyn had entered the water to rescue 2 children from the rock groynes off the Nova centre. The ILB was requested to back up by Holyhead coastguard. there was a crew at the boathouse already, and the boat was launched within 3 minutes. The ILB crew arrived on scene to find the lifeguard had managed to get the children ashore, but they had lacerations from contact with the rocks, and so a crewman was sent ashore to help with first aid until the ambulance arrived. Once the children were in the ambulance, the ILB crew departed for Barkby beach slipway, because, due to the weather conditions, the 4-mile run to the west for the station would be difficult, and so the ILB was recovered at Barkby beach and returned to station by road at 1410. ILB brought to immediate readiness after North Wales police received a 999 call stating a woman and child were cut off by the tide between Rhyl and Prestatyn. Police helicopter NW1 was already airborne, and as they got on scene, they were informed all persons safe ashore and accounted for. All units stood down at 1800. Classed as standby. ILB crew paged to launch to 2 young females apparently in difficulty swimming off the Nova Centre, Prestatyn. AWB also proceeded down beach to back-up ILB due to weather conditions – force 7 north-west wind and heavy surf. ILB launched within 5 minutes, and Rhyl coastguard team also proceeded. As the ILB was about 1/2 mile from the Nova, it was reported by the coastguard that the children were safe ashore and lifeboat assistance was no longer necessary. ILB returned to station at 1935. Whilst the crew were out on exercise with a RNLI assessor, Holyhead coastguard requested they search the shoreline between Rhyl and Prestatyn for a 30-year old woman, who had gone missing 2 days earlier, and whose car was found on a promenade car park. nothing wa found, and so the ILB crew carried on with the exercise at 1630. ILB launch requested by police to a male off Rhyl promenade, having taken an overdose, was attempting suicide by running into the sea. As the crew were assembling, Holyhead coastguard reported that the man was now out of the water and in police custody, so the launch was cancelled, being classed as standby. ILB taken by road to Rhyl harbour to launch in more sheltered conditions to go to the assistance of yachts “Sarah 2” and “Magic”, who had set off from Rhos on Sea harbour earlier to go to Rhyl. They had encountered rough seas off Kinmel Bay, and required assistance. The AWB also launched. The “Sarah” was nearest the harbour and was closely escorted into the harbour by the ILB, who helped secure the yacht on a mooring. The ILB then stood by until the AWB arrived escorting “Magic” into the harbour, and assisted in mooring that boat too. The ILB was recovered and returned to station for approximately 1400. ILB and Rhyl coastguard paged after a member of the public reported a person waving on a dinghy off Pensarn beach. The ILB arrived on scene and was directed to the spot by Rhyl mobile with the first informant, and ended up alongside the Pensarn sewer buoy, which had a shag ( a type of cormorant) drying it’s wings on it. The buoy was lying on it’s side, looking like a boat, and the bird flapping it’s wings looked like someone waving. Satisfied all was well, all units returned to station by 1720. Llandudno mobile coastguard had been paged to observe a small rowing boat about 1.5 miles out from Llanddulas Jetty. The ILB crew were paged as the coastguard could not see if anyone was on board. The ILB was on scene within 20 minutes and found a 2 metre rowing boat with no persons on board, half full of water. There was no sign of recent occupation. The ILB took the boat in tow and proceeded to Colwyn Bay’s Aberhod slipway and the Landrover LR74 and trailer also proceeded the 10 miles West to pick up the ILB as the light was fading fast. The boat was recovered at the slipway to Llandudno coastguards, and the ILB was recovered and returned to Rhyl by road, being ready for service by 2300. DLA paged for immediate readiness of ILB for attempted suicide in Rhyl harbour. As it was low water, the crew kitted up to go via road to the harbour to assist the police helicopter NW1 and ground police units to get the man out of the water. He came out on his own into the custody of the police, and the ILB was stood down at 2348. This is the 3rd time this year we have been alerted to this same person. Our station boat D632 has had to be taken away again for repairs (probably due to all the use lately!). It has been replaced by D660 from the reserve fleet. The boats were changed over on 1/8/2006. A day of strong WSW winds, contributing with high tides, caused a very busy day. The ILB crew on normal Sunday morning meet, saw 2 inflatables with 4 children on them, being blown out to sea off Kinmel Bay. The ILB launched in 3 minutes, and was soon alongside the dinghies. The children were assisted ashore , and it appears that they had been blown over 1 mile along the shoreline by the wind, and the incoming tide was making them go further out from the shore. The children were handed over to Rhyl mobile coastguard who saw them safely back to their starting point. ILB returned to station at 1239. Holyhead coastguard received a 999 call from a member of the public on Rhyl East promenade, regarding a Jet-Ski, stopped in the water, with a person clinging to the side. The ILB launched and came alongside the craft in 2 minutes. The owner had an electrical problem and couldn’t restart the ski. he had phones a mate on his mobile to tow him in to the harbour, but the ILB was alongside first. The owner declined a tow from the ILB, and so the crew stood off until his mate arrived, and the ski was towed back to the lifeboat slipway, and recovered there as another mate had brought the trailer to the boathouse. The ILB was recovered at 1510. ILB requested to launch to various inflatables being blown out from the local promenade areas. The ILB recovered 3 and returned them to the boathouse by 1530. ILB launched again to 3 inflatables off Kinmel Bay/Towyn areas. They were picked up and returned to their owners on the beach after checking everyone was OK. Returned to station at 1545. ILB asked to recover 1 inflatable off Rhyl. returned at 1610. Rhyl coastguard mobile reported 2 swimmers in the water off Kinmel bay, struggling to get back ashore. The ILB launched and was on scene in 4 minutes. The swimmers had managed to get to shallower water, and able to stand up. The ILB crew escorted them ashore, and returned to station at 1630. As the crew were getting ready to launch the AWB for a publicity display at Colwyn Bay, the ILB was requested to assist a small inflatable with 2 children on board, struggling to get back to shore at Towyn, due to the strong offshore breeze. The ILB was launched within 4 minutes and on scene 5 minutes later. The children were escorted ashore and the ILB crew returned to station at 1120. Rhyl beach guard reported to Holyhead coastguard that they could see a small inflatable with 2 persons on board 1/4 mile off Kinmel bay, going round in circles. The ILB was requested and was on scene in 4 minutes. The 2 were taken onto the ILB and returned to the shore. The ILB returned to station t 1545. ILB asked to launch after request from Rhyl beach guard to search for a missing 5-year old child last seen by the shore. Coastguard units also alerted. 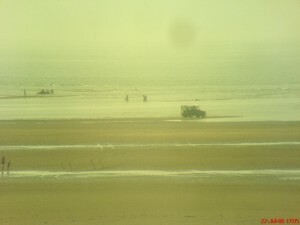 as ILB crew was assembling, the beach guards reported the child was found safe on the beach and all units stood down. Classed as standby. Holyhead coastguard received a 999 call reporting person on a small boat about 2 miles off Golden sands holiday camp. ILB launched and found that the casualty was the sewer buoy marking the outer sewer outfall. ILB returned to station at 1604. Holyhead coastguard received numerous 999 calls regarding a small boat off Golden sands camp, Towyn, quite far out, with a child waving. There was a crew at the station, and the ILB was launched within 3 minutes. When off the “boat”, it was seen that the object was the local sewer outfall buoy, green in colour, but caked in bird mess, and with a cormorant drying it’s wings on the top. The ILB reported the fact and returned to station at 1525. ILB launched in search for male adult believed to be either in a small inflatable, or swimming, off Robin Hood holiday camp, Rhyl. People had phoned 999 to report they had seen a child at the water’s edge shouting for her daddy. Police officers and Rhyl coastguard team were also on scene. The AWB crew also launched, and used night-sights and white parachute flares to illuminate the area. The rescue helicopter from RAF Valley, Anglesey, was also used after 2 hours to use its FLIR (forward-looking infra-red) vision. Nothing was found, and the first informants were adamant they had heard the child crying. the search was called off at 0400 after nothing was found, and the ILB returned to station at 0415. Combination of offshore winds and an ebbing tide told the crew they were in for a busy afternoon. The first one came very soon. ILB launched after Holyhead coastguard received 999 call about an inflatable going out to sea off Kinmel Bay. This was found with no-one on board, and the local coastguard mobile was contacted on shore by the owners, stating no-one was on board when it was blown offshore, and so the ILB returned to station at 1240. Rhyl beach guard reported a black inflatable being blown off shore at Kinmel Bay again. This was again empty. On returning to Rhyl central, a report came in about another inflatable with 1 person on board being blown out off the promenade. The ILB arrived on scene to find Rhyl beach lifeguards had successfully rescued the person and no assistance was necessary. The ILB returned at 1314. The ILB crew had just arrived back when they were requested to re-launch to 3 incidents of inflatables being blown out off Rhyl. 3 people were brought ashore and their inflatables also recovered. The ILB returned to the boathouse by 1328. A report from Holyhead coastguard said that they had received numerous 999 calls about an inflatable with 1 girl aboard about 1/2 mile off Golden Sands camp, Towyn. 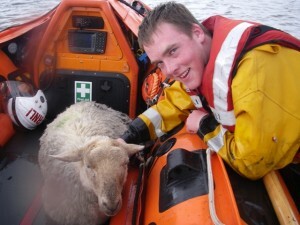 She was taken aboard the ILB and returned to shore with her craft. The ILB crew returned to the boathouse at 1458. Rhyl beach guard reported they had been informed of a missing 4-year old boy on Rhyl beach by the Central lifeguard hut, he had last been seen at the water’s edge. As the crew were getting ready, the beach guard reported that a woman had found the boy in the shallows at the water’s edge and was taking him back up the beach. The ILB was stood down at 1537. Classed as standby. ILB crew brought to immediate readiness for some people on the training wall marking the river Clwyd at the entrance to Rhyl harbour. Stood down as they made it ashore OK at 1445. ILB crew paged to launch for 6 people stuck on a sandbank opposite the boathouse. 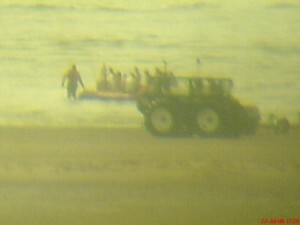 As the crew assembled, the people managed to wade ashore unaided, and so the launch was cancelled at 2012. ILB crew paged for immediate launch to report from a lady who dialled 999 saying her husband was in difficulty swimming off the Nova centre, Prestatyn. Rhyl beach guard were also called, as was Rhyl coastguard mobile. All units proceeded to scene within 5 minutes and got to site to find that the man had been pulled in by some of the public. He was OK, but very tired. The coastguard checked him out, but he was fine. All units returned to station, the ILB by 1435. The ILB crew were just arriving by road at Prestatyn for the local carnival when Rhyl coastguards were diverted to a report of an upturned boat off ASDA Kinmel Bay. The ILB was taken to the local slipway on standby, but the coastguard reported the object was actually the local sewer outfall marker buoy on its side, so the launch was cancelled, and the crew took part in he carnival. Rhyl beach patrol requested coastguard and lifeboat assistance to help them and the North Wales police helicopter NW1 in the shoreline search at low water for 2 missing 12-year old boys. The ILB launched and had been searching the shoreline for about 15 minutes when the beach guard reported the boys had been found on the beach and all units were stood down at 1700. The ILB had recovered and was being taken back to the boathouse when the beach guard requested the crew re-launch to 2 persons stuck on a sandbank off the Sky Tower at Rhyl. The ILB picked them up and transferred them back to the shore. The ILB returned to station at 1721. The crew had only just started washing the boat down after the last service when Rhyl coastguard mobile reported 7 people stuck on an adjacent sandbank. the ILB launched again, and recovered all 7 in one go, returned them to the beach, and returned to station at 1810. The crew and other fundraising RNLI members had just begun the Annual General Meeting at the boathouse, when Holyhead coastguard rang the boathouse to report a small inflatable dinghy with 5 persons on board, and with a small outboard motor, seemed to be having difficulties getting back into Rhyl harbour. The ILB launched within 3 minutes, and came alongside the craft. The man in charge said they were OK, but agreed to take some of the people off his boat at the harbour entrance. Once this was done, the 2 remaining on the boat were monitored to see if they were OK. They were wearing lifejackets, but the others were not. After 10 minutes, the craft was obviously now OK with just 2 in, and so the ILB crew returned at 1955. A local coastguard officer reported a small inflatable off the Sun Centre on Rhyl promenade. He could not see if anyone was on board, and so Holyhead coastguard requested the ILB check it out. The Boat was on scene within 4 minutes as the crew were already on station for filming for BBC “Newsround” programme to be shown on 31st July. The dinghy was taken on board and a small-area search undertaken to see if anyone was in the area. No-one attracted the crew’s attention, so the search was called off and the ILB crew returned to station at 1632. Same as yesterday, only hotter. As well as the ILB launching 5 times, the LandRover was also used to alert people who were refusing to come off the sandbanks as the tide was coming in behind them. The beach guard had told people to no effect, but the presence of the LandRover with blue lights on and public address system soon made people aware of the danger. ILB crew launched to reports of numerous inflatables and dinghies being blown offshore at Kinmel Bay. 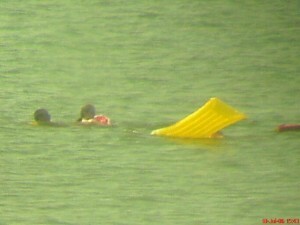 At least 6 inflatables were recovered with no-one on board. No persons were reported missing and the local coastguard mobile reported all safe, so the ILB returned to boathouse at 1418. ILB requested to launch again to 2 inflatables off Pensarn beach with 2 persons on each. On arriving on scene, the dinghies were nearly ashore, and so the ILB crew escorted them in and gave some sea safety advice. The ILB returned to station at 1520. As the crew were just returning to station, Rhyl mobile coastguard reported an inflatable with 1 person on board, being swept out to sea at Golden Sands camp, Towyn. They re-launched and picked up the child and returned him to the beach, returning by 1538. The crew had only been gone from the boathouse about 10 minutes when Holyhead coastguard set off the pagers after Rhyl coastguard mobile reported 3 persons being blown out to sea on an inflatable off the Nova Centre, Prestatyn. 1 had managed to swim ashore, but the other 2 were struggling. 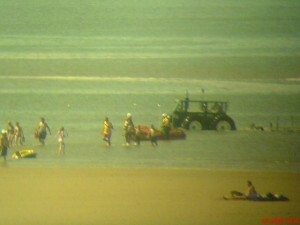 The ILB was on scene within 8 minutes just in time to watch the people make it ashore. The coastguard gave the sea safety advice this time. The ILB crew returned to station by 1900. The ILB crew were once again just getting home when the pagers were activated again. The call this time was to a fully clothed woman apparently committing suicide off the Children’s village on Rhyl promenade. The ILB was on scene within 5 minutes to assist the coastguard and police persuade the woman to leave the water. She was looked after until the ambulance arrived about 3 minutes later, and taken to hospital for a check-up. The ILB was back on station by 2000, hopefully for the day ! Hottest day of the year. Over 90º , Southerly wind, tide coming in. Perfect conditions for problems for the unwary. it was a quiet morning, then everything went haywire…..
Rhyl beach guard reported 3 inflatable dinghies with persons on them being blown out from Kinmel Bay. the ILB launched and quickly located the dinghies. the occupants had managed to get ashore. 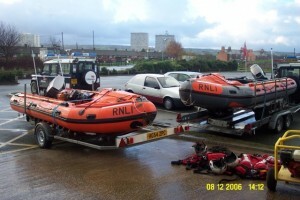 The ILB collected up the dinghies, and returned them to their owners, imparting safety advice to the recipients. The ILB returned to station at 1401. The ILB had just returned when the beach patrol reported they were having difficulty getting everyone off the sandbanks as the tide came in. The ILB made it’s way around the shallows and banks and eventually had 11 persons in the boat, who were returned to shore at 1418. The ILB was requested by Rhyl mobile coastguard to go to Pensarn beach to investigate an inflatable off the camps. When the ILB arrived on scene, there was no-one on the inflatable, but a quick dash to the beach with the inflatable produced the owners. Again, safety advice was given to the owners. The ILB was returning to Rhyl when a call from Rhyl beach guard came at ……. Rhyl beach guard reported that 2 of their lifeguards had entered the water off the Sea Life Centre at Rhyl, to go to the aid of a young girl, who was oblivious to the fact that she was rapidly going out to sea on her li-lo. The guards got to the girl and were assisting her back to the shore when the ILB came alongside them and escorted them all to shore. The ILB came back to station by 1549. The lifeboat tractor driver, who was out on his personal watercraft, reported that a small speedboat had broken down in Rhyl harbour, and was being taken upstream under the road bridge in the river Clwyd. The ILB was on scene within 3 minutes, and assisted with the recovery of the speedboat and it’s 2 occupants back to the slipway in the harbour. The ILB returned to the boathouse at 1604. The ILB crew had only been gone 5 minutes from the boathouse when the pagers were activated to a person in a dinghy being taken offshore at the Nova Centre, Prestatyn. The crew were just assembling when it was reported to Holyhead coastguard that a lifeguard from the local swimming pool had recovered the dinghy and it’s occupants back to the shore, and so the ILB was stood down, finishing at 1812. ILB launched after Rhyl beach guard reported to Holyhead coastguard that they could see an inflatable dinghy about 1/2 mile offshore at Towyn. The ILB made it’s way to the scene to find that the dinghy and it’s 2 occupants had nearly made it to the shore. The ILB crew stayed to make sure all was OK then returned to station at 1455. Rhyl beach guard requested assistance to various inflatables being blown offshore at Towyn and Kinmel bay. The ILB crew were directed by Rhyl coastguard mobile to a dinghy about 1/2 mile off Towyn. The beach guard boat crew came across an inflatable ring with no persons on board, but the boathouse had actually seen someone try to swim to the ring, give up, and return to the shore. The ring was retrieved and returned to it’s owner. The ILB proceeded under directions from the boathouse, to a dinghy with one person clinging to it. When the ILB arrived on scene, another person in an inflatable dinghy had rowed out to the first inflatable, and succeeded to get it back to the beach. The ILB crew made sure everyone was OK, and as the beach guard boat had recovered the other dinghies, both boats returned to station by 1450. Rhyl beach guard boat and the ILB were asked to launch to search for a missing 3-year old boy near the water’s edge. As the boats were just launching, Rhyl coastguard learned that the child was safe ashore, and so both boats were stood down at 1628. Rhyl Beach Guard reported to Holyhead coastguard that they could see an inflatable being blown out to sea off Kinmel Bay, but were uncertain that there was anyone on board. The ILB crew were paged, and the boat was launched within 4 minutes. The inflatable was picked up with no-one on board. The ILB crew made a short search of the area, picking up 3 other inflatables, one of which was being chased by a swimmer, who luckily gave up the chase and returned to shore. The ILB crew returned with the inflatables and was back on station by 1515. 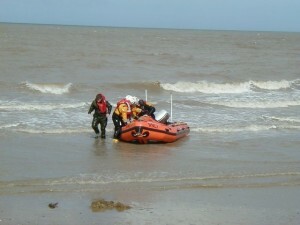 ILB crew paged to search for inflatable dinghy with 2 persons on board, off Presthaven sands holiday camp, Prestatyn. AWB also launched. The ILB found the dinghy with the 2 men on board,1.5 miles out. They had been drifting for 2 hours. They were cold but otherwise OK. The ILB took the men on board and towed the dinghy back to the beach, where they were met by Rhyl coastguards, and were given some advise about dinghies and offshore winds. When found, the dinghy was in the middle of the navigable channel to Mostyn docks. The ILB returned to station by 1550. The crew were washing the boat down when Holyhead coastguard radioed that a woman had gone into the water off Sunnyvale camp, Kinmel Bay, after her 2 dogs. Just after the ILB had launched, the first informant rang Holyhead coastguard to report the woman was now safe ashore. The ILB returned to station by 1610. ILB crew asked to investigate a black dinghy going out to sea about 1/2 mile out from Rhyl Sun centre, after Holyhead coastguard received 2 999 calls from the public.. The ILB crew came across a small inflatable dinghy about 2 metres long, with no-one on board. a search was commenced between Splash Point and Kinmel Bay, but nothing was found. the crew were then directed by Flint mobile coastguard to an object about 400 metres out from the Marina apartments at Rhyl. This turned out to be a helium party balloon. With no-one reported missing, the ILB crew carried out a further inshore search on the way home, returning by 2045. ILB launch requested by Holyhead Coastguard to 2 inflatable dinghies with 2 children on board, drifting out off Kinmel Bay. As ILB arrived on scene, one of the dinghies had made it ashore, and the other was escorted back by the ILB crew. Once safe ashore, the ILB returned to station by 1535. ILB crew paged to launch to 2 small inflatables apparently not making any headway, off Kinmel Bay. When the ILB arrived on scene, they found a 3 metre inflatable, with 2 men on board, with a small outboard motor, and towing a child’s inflatable dinghy with their fishing gear in it. They were not wearing lifejackets, but they had them with them. They were asked where they came from , and they said Prestatyn, some 6 miles to the East. They were advised to start back for their base, and did so, but were making very little forward speed. Holyhead coastguard advised that, as they did not want assistance, the ILB was to return to station, which was achieved at 1625.Then at…..
the ILB crew was requested to launch to the yacht “Sheldrake” off Prestatyn, which was also seen to be making little headway. This was the vessel that was found drifting 9 miles out on 10th June. there were now 3 on board, and when the ILB came alongside, the engine was heard to stop. There was obviously a fault, and the 3 men on board were advised due to conditions, they should return to Rhyl. They were not able to get very far under their own power, and so the ILB crew took the yacht in tow, requesting the AWB to take over the tow. This was done, and the ILB was released to return to station, but Rhyl mobile coastguard requested that the ILB go to the original 2 in their dinghy, who were now off Splash point, Rhyl. This the ILB did, and advised the pair to beach their boat as it would be better to get ashore. The coastguard then kept watch as the dinghy was beached. The ILB then made for Rhyl harbour, transferred the men from the AWB to shore, and took over the tow of the yacht to put it on a mooring. Once this was done, the ILB crew returned to station at 1800. ILB crew requested to launch to assist search by Rhyl beach guard for a missing 9-yesr-old girl, last seen by her family at the water’s edge. The crew had just got to the water’s edge when the beach guard reported the child had been found, and the crew returned to station. ILB crew paged to launch to 2 inflatables seen in the channel leading to Rhyl harbour, seemed to be in difficulty. The crew launched the ILB, and was alongside the dinghies within 2 minutes. The dinghies had managed to get to shallow water, and so the ILB crew monitored their progress until they were ashore, with 1 crew member assisting the beaching of the dinghies. The ILB returned to station at 1855. The crew were just getting to the boathouse for a barbeque when one of the crew spotted what looked like an upturned boat with a person near it . The ILB crew notified the coastguard, and the ILB was launched. The object was near the windfarm, about 5 miles out. When the crew arrived on scene, they found a 4m long plastic bag, tied at both ends, and there appeared to be something moving under it. This was extricated as the crew hauled the bag into the boat, and appeared to be a large fish ! The bag was recovered and the crew returned to station by 1650., and at…. the ILB was requested to attend an incident at Llanddulas jetty, where a man had been chased by police and had dived into the sea. The report was that he was unconscious, but when the crew arrived on scene, he had scrambled up the jetty and was sitting on the cross spars just above the waterline. The ILB crew were unwilling to get close, but the guy was seen shivering and starting to go hypothermic. The man was contacted and told to jump into the water, this he did, and the crew immediately picked him up. The man was taken to shore to be taken to hospital by ambulance. The ILB crew returned to station by 2030.
when Holyhead coastguard reported a dinghy going out to sea off Golden Sands camp, 2 miles to the west of the harbour. The ILB crew found a 1-metre long inflatable child’s dinghy with no-one on board, and another was found soon after. One of the ILB crew went ashore to talk to onlookers, and one young girl stated she may have seen a child on the dinghy. The ILB crew then conducted a search close inshore for some 1 mile either side of where the dinghy was found, and local coastguards undertook a beach search. After 1 hour, no-one was reported missing, and so the search was called off, with the ILB returning to station at 1805. A small yacht was observed off the end perch at Rhyl, without lights, and apparently drifting. It was attempting to get into the harbour, but couldn’t because it was low water and the tide was out. The ILB launched and came alongside as the yacht “Nutshell” was about 1/2 mile off shore opposite the boathouse. The crew went alongside, and found 3 persons on board. The yacht had sailed from Liverpool earlier in the day, and the crew had been celebrating a lot. They were told they needed to anchor and put on an anchor light. This was done, and once the ILB helmsman felt all was secure, the ILB returned to station at 2355. Whilst ILB was on it’s usual Sunday morning exercise, a call came from Rhyl beach guard to assist with a woman swimming in the River Clwyd and going further out to sea. the beach guard boat was on scene first, and managed to get the woman on board. The ILB crew then escorted the beach guard boat back to the harbour, and the ILB then continued with the exercise at 1145. ILB crew paged to go to the aid of a broken down boat off Towyn. When the crew were about 1 mile off, word came to them that the incident came from the police at TYWYN, in mid-Wales near Aberystwyth. The ILB returned to station by 2035.False alarm, good intent, mistaken identity ! Beach guards at Prestatyn reported to Holyhead coastguard that there was a jet-ski with people waving on it, about 1 mile off Barkby beach. The ILB crew was paged, and the ILB was on the water 5 minutes later. It took 12 minutes to get on scene, and the ILB crew found that there were 3 people on this craft, which had broken down. it was then 1.5 miles out from the shore. The 3 people were taken onto the lifeboat and the jet-ski was towed back to Barkby beach, and then the ILB returned to Rhyl by 1540. ILB requested after 999 call to Holyhead Coastguard with a man shouting for help off Presthaven Sands holiday camp, Prestatyn. ILB was on scene 12 minutes later, and police helicopter NW1 and coastguards were searching the shoreline. The ILB had been searching for 5 minutes when the crew heard muffled shouts. The ILB engine was stopped, and the crew heard the shouts again. The voice was actually out to sea, and one of the crew spotted a head about 50 metres in front of them, about 300 metres from the shore. The ILB sped to the place, and recovered a young male, fully clothed, nearly unconscious, into the boat. The helmsman tried to get to the beach, but was hampered by shallow water. The AWB was on scene by then, and so the ILB helmsman came to the AWB, and 1 crew member went aboard the AWB to assist. With 4 crew and the casualty on board , the ILB returned, and the crew were able to haul the ILB over the shallows into the deep gullies, back to waiting coastguard and fire teams on the shore. The casualty was taken ashore under the illumination of the AWB and the police helicopter, and was transferred to an ambulance about 400 metres away. Both boats returned to station, the ILB arriving at 0235. 3 males were seen walking out along the wall which marks the entrance to the river Clwyd. this wall covers as the incoming tide approaches. The ILB was re-launched and the 3 males (who were rather inebriated) were escorted to safety. The ILB returned to station after the 3 were safe ashore, and was ready for service by 2040. Rhyl coastguard and some of the beach guard had already been on the beach since 0800 after the discovery of a rifle-launched grenade on the beach. The area had been cordoned off, but with people coming on to the beach, and water craft starting off, the police requested lifeboat presence to provide an exclusion zone seaward of the device. The ILB launched and anchored off about 1/4 mile, picking up beach balls on the way which were going out to sea – a forewarning of what was to come. The ILB crew then spent time warning sea-users about the exclusion zone. Due to the nature of the elements, the senior crew decided to take advantage of the training exercise boat D-466 to take over guard duties to free up the ILB, and so the ILB returned to station after D-466 launched. D-466 launched with 3 crew on board to take over guard duties for the exclusion zone, as reports were coming in thick and fast of inflatables being blown out to sea. They were to stay out until 1245 after the bomb squad successfully detonated the device and declared the beach clear. Rhyl beach guard requested ILB launch to 2 persons in inflatable dinghy off the Nova Centre, Prestatyn, being blown out. As the ILB got to the Rhyl/Prestatyn border, it was reported that the occupants had ditched the dinghy and swam ashore OK. ILB returned to station. ILB once again requested by beach guards to go to Nova Centre Prestatyn. 2 men had been swimming near the rock groynes and had tried to get onto the rocks, one had cut himself. The beach guard had swum out and had used his float device to support the 2 men and took them away from the rocks until the ILB arrived. The 3 were taken on board the ILB and taken back to the Nova, where 1 was taken to hospital to treat the lacerations to his body. ILB returned to station by 1325. ILB launched to pick up yacht left at low water by AWB and tow it into harbour. 4 crew were on ILB, transferring1 crew to the yacht. 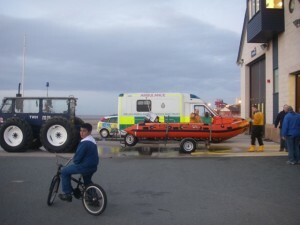 The boat was successfully moored in Rhyl harbour and the ILB returned to station by 2050. Holyhead coastguard requested ILB launch to a dinghy off Prestatyn Ffrith beach. The local coastguard mobile was already on scene. The ILB was on scene in 8 minutes and found a 2m inflatable dinghy upturned near the rock groynes. A quick search found no-one on board. Due to the failing light, the coastguard requested the AWB back -up the ILB. With both boats searching for over 1 hour, it was assumed that this dinghy could well have been one which was blown out to sea in the afternoon, as the wind was now onshore. The search was called off at about 2230 and the ILB was back at station by 2250. Rhyl Beach Guard requested ILB launch to assist a small speedboat stuck on a sandbank in the middle of the River Clwyd in Rhyl harbour. As the crew were assembling, the Beach guard reported the speedboat’s occupants had managed to pull the speedboat off the bank, and were going back into the harbour. The launch was cancelled at 1240, classed as standby. Rhyl beach guard were observing a small inflatable off Rhyl boathouse at low water. the single occupant had raised some sort of sail, and was going further out. He was then seen to lower his sail and try to paddle back to the beach, about 1/2 mile out. He was seen to struggle and so the beach guard requested the ILB. The ILB launched 5 minutes later, and went alongside the craft. The “sail” was a piece of plastic sheeting on a dowel, and the rudder and boards were made of plywood. The man admitted he didn’t realise the tide and wind had taken him so far out, and he was struggling getting back to shore. The ILB crew took him on board, and towed the boat back to shore. It appeared that the man had bought the dinghy in the midlands, came on the train to Rhyl, and set up his boat. In the proceedings that followed, the man had got his mobile phone and all his belongings soaked, and faced a damp journey home. The ILB was back at station at 1710. ILB requested to launch to assist shore parties searching for elderly male, believed to be at water’s edge. ILB had just launched when Rhyl Coastguard reported the man was now with them and was OK. All units stood down, and the ILB returned to station at 1420. ILB launch requested by Rhyl Beach Guard via Holyhead Coastguard. 3 Persons were seen trapped by the incoming tide off Kinmel Bay. The ILB was launched, and arrived on scene just as the adult was getting to shore. He confirmed he was waving for assistance, as he did not know the depth of water in the gulley between him and the shore, and thanked the crew for their response. The ILB returned to station at 1450. A speedboat with 3 adults on board was seen making laboured progress back to harbour, it’s outboard engine smoking badly. The ILB launched and came alongside just as the boat made the entrance to Rhyl harbour. The men on board said they were alright, and the ILB was not required. As the ILB was leaving the harbour, they came across a dinghy in the harbour entrance with 2 children on board, drifting without paddles. The crew were on scene immediately and returned the dinghy and it’s occupants back to shore. A crew member spotted that the original casualty had now broken down in the harbour, and it was towed by the ILB crew back to the fisherman’s slipway in the harbour. The ILB returned to station by 1538. ILB launch requested to assist with searching for a woman in the water to the west of the boathouse, thought to be committing suicide. On arrival at the station, the mechanic saw the woman off the boathouse, and went to her in the LandRover. She was rather the worse for drink and was brought back to the boathouse and handed over to coastguards. The crew left the station at 2150. ILB launch requested to assist North Wales Police search for a man seen entering the water Between the Alexander hospital and Splash Point on Rhyl promenade, Coastguards and the police helicopter NW1 also tasked. When the ILB and helicopter arrived on scene, the man had left the water and was apprehended on shore by police. All units stood down and the ILB was ready for service by 1758. ILB launch requested by North Wales police, also local coastguard and police helicopter NW! also tasked, to man apparently committing suicide about 50 metres out in the water off the Sea Life Centre, Rhyl promenade. The ILB launched and went alongside the man, who was over his waist in water. The helmsman recognised the man as the one the ILB had been called out to on the 13th April, and so he returned to the shore, to pick up a police officer to assist. The man was brought into the boat and returned to the boathouse to a waiting ambulance. The ILB was back on station at 0200. ILB launch requested by North Wales Police to assist officers in water off Rhyl promenade, who were attempting to get a young male back to shore. The police helicopter NW1 was overhead, pinpointing the spot where the officers were, about 100 metres out across the sandbanks. The ILB and crew went to the water’s edge and the ILB took the 2 police officers and the man onto the boat, and returned to shore, and to the boathouse, where an ambulance took the man to hospital. The 2 police officers were taken from the boathouse by their colleagues, and the ILB was ready for service at 2028. The skipper of the sport fishing boat “Jensen” had only been fishing with a party of anglers from Rhyl for about 10 minutes, when one of the party was violently ill and complained of tingling in his arms and legs. The skipper contacted the station mechanic and the ILB was launched within 5 minutes. The casualty and his mate were transferred to the ILB about 1 mile north-west of the boathouse, and the ILB returned to the boathouse, where the casualty and his friend were transferred to an ambulance. ILB ready for service by 1215. ILB requested to back up police and coastguards searching Rhyl beach for a woman attempting to commit suicide. AWB also requested as wind was gusting Westerly at up to 40 knots. As ILB was going on to beach, coastguards reported woman had been found, and all units were stood down by 2120. 5/2/2006. 1436 Holyhead coastguard requested ILB launch to assist Rhyl coastguard to retrieve a dog, swimming in Rhyl harbour, after the owner had tried to go into the water to try to rescue the dog. 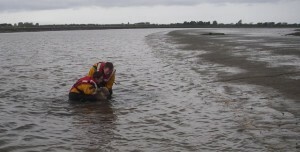 The owner was assisted ashore by the coastguards, and the ILB crew returned the dog to shore. The ILB returned to station, being ready for service at 1515. ILB launch requested by Holyhead coastguard from North Wales police, to assist with male in the sea off Rhyl west promenade. As ILB crew were getting ready, the coastguard cancelled launch as the male had been brought to shore by police officers. Ready for service by 0055.